So — I finally found a camera bag that I like and am not going to return for a refund. Mind you, it’s not the perfect bag for all situations (no such bag exists IMO), but it fits my immediate need for a bag to carry some gear in a manner I’m comfortable with. Bags are such a personal thing but I thought this little review might give someone an idea of what to expect from the Domke F-2. The type of bag I was searching for was something to carry on photowalks and also transport my camera and a lens or two in the trunk of my car (keep gear from rolling around and be available so I can just grab the bag if I decide to stop and take an impromtu photowalk). I was also hoping to find a bag which would do double duty and serve as a half-camera/half-general-purpose bag on an upcoming trip to Europe. Since I’m fortunate enough to live in a city which has a full-blown camera shop (Precision Camera in Austin, TX) I was able to take my gear into the store and try packing it in various bags — that helped eliminate many possibilities up front. I also had a friend who allowed me to borrow a Kata sling for a month or two. I ended up really liking the Domke in the store and when I first used it “for real” I just loved it. 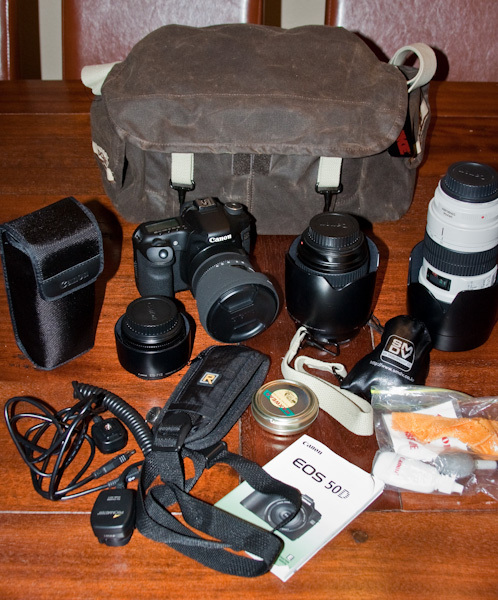 The image below shows the bag along with the gear I’ve recently been carrying in it. I could easily fit more if I chose to stuff every corner. Please excuse the lousy product shot using on-camera flash and taken with no thought regarding setup or background. Granted, the bag was heavy with those items but they easily fit and I still found the bag easy to work out of. The shoulder strap is a couple inches wide and is quite comfortable. Note that I wouldn’t normally carry all that gear but I wanted to put the Domke through its paces. The bag itself is extremely lightweight and forms to your body. There are removable inner compartments (velcro) but even when those are used, the outer shell of the bag remains flexible and allows the bag to effectively collapse and shrink into a smaller bag when you don’t stuff it full. This is a big plus in my book — I don’t like the stiff, permanently-shaped bags. A downside to this is that there’s no outer padding (just the internal compartments are padded). The four outer pockets (two in front, one on each end) have no padding whatsoever. Advantage: pockets collapse small when not used. Disavantage: if you’re putting delicate items in those pockets you need to be extra careful with your bag. Zippers…the only zipper on the bag closes the pocket on the inside of the top cover. I wish there were zippers on a few other pockets because the loose flaps make me a bit nervous that something small might fall out or that someone with a small hand might be able to grab something out unnoticed when in a crowd. The top cover includes two metal clips in addition to velcro to keep it securely closed. The Domke is available in a regular canvas material or a waxed canvas. I chose the wax for a little protection.